Once upon a time, Lady Sophie Talbot was considered the plain, least interesting and unfun one of the Talbot sister (aka Dangerous Daughters).Those days are gone. Whenever I open up a book by Ms. MacLean, I get the same feeling as when I visit with a good friend I haven't seen in a long while and.catch up on the latest gossip, Granted, I don't personally know Ms. MacLean, but I think anyone who has ever read a book will agree that the personality of the author shines through, and I can't help but feel that if I ever had a long and meaningful conversation with her I'd find I like her very much. When I pick up one of her novels I know from experience that I'll be amused and entertained for a good number of hours, and be left with a smile on my face, and extra bounce in my step, and a feeling that all is well with the world. Her novels are well thought out, skillfully crafted, and oozing with charm, humor, strong heroines,witty banter and heroes that have a habit of stealing their way into your heart. 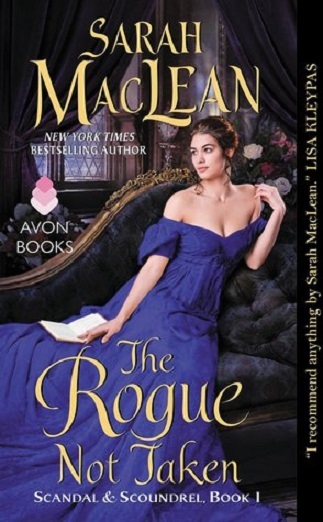 If I was single and could choose any author to craft my perfect match for me, Ms. MacLean would be among those at the top of my list. I started reading her stories with the publication of her second book, 'Nine Rules to Break When Romancing a Rake' and a friend tipped my off that she had written another book, 'The Season', which I immediately read and devoured. Since then, I've eagerly awaited the publication of each and ever one of the book she's written since. I am definitely a huge fan. Lady Sophie is a woman who is caught between two worlds--the one she longs to go back to and one she doesn't feel she fits into. Despite what Eversly says, she is a fun character who is down to earth with no misgivings about the ton. The treatment that Sophie and her sisters receive at the hands of the ton tugged at my heartstrings and endeared her to me. For years she's been following the rules and its gotten her and her sisters little more than the title of "Dangerous Daughters" and the scrutiny of the scandal sheets. While her sisters like the attention, Sophie loathes it. She hates the falsity of the ton and all that goes with it. She's trying to find her place in the world. She just isn't convinced it's with the aristocracy. Initially the Marquess of Eversley (aka King) seems as big a cad as Sophie's brother-in-law, but we quickly see there is more to him than initially meets the eye. King is a self proclaimed career bachelor haunted by events that took place fifteen years ago. He's been called home by his father who reportedly is on his death bed. Years ago King and his father had a major argument which led to King vowing never to return. He's never gone back and is only going home now to give his father a piece of his mind before he passes. When Lady Sophie ends up in his carriage, he reluctantly feels obligated to see her safely home, but things have a way of happening around Sophie and nothing goes as planned. As the two spend more and more time together, they slowly get to know one another and feelings start to develop. King becomes torn between what he now wants and what he thought he did. Overall, I gave this one 5 out of 5 roses. A wonderful story about two misfits who may not be perfect, but are perfectly suited for each other. I loved seeing these two open up to each other, and understand exactly where the other was coming from. Both are romantics at heart who find love when they least expect it. On the Lisarenee Romance Rating Scale, this one earned a STEAM rating - too hot for a fan, but you still have a handle on things. You should use extreme caution when reading a book with this rating in public. People may inquire as to why you looked flustered and flushed. If you haven't guessed, I highly recommend this book and author. If you've not yet read one of Ms. MacLean's books, now is the time to treat yourself to a special read.